Once upon a time, David Kantrowitzi and Greg Nix met each other on a mess hall team at the Upright Citizens Brigade. There was a melding of minds and out of that symbiosis came a Nickelodeon animated digital web series called Space Kid and Cat. After much blood, sweat, tears, writing, voice work, music and artwork, they’ve managed to create something truly special. The series follows a boy and his cat companion on many a space escapade where lessons are learned and friendship bonds are solidified. We talked to David about what it took to bring the series together, his animation inspirations, Rick & Morty, and the uncanny similarity between this series and the equally enthralling Final Space. Yes, great minds think alike! Enjoy the interview and watch all four episodes now! 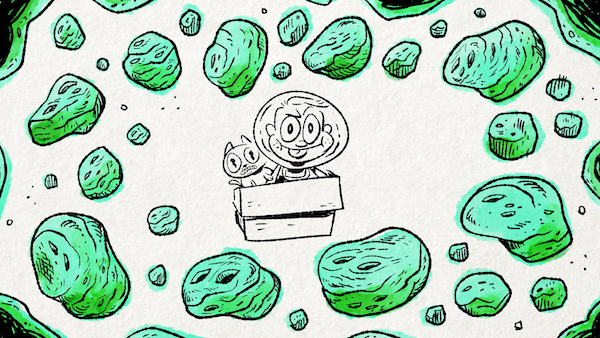 COMEDY CAKE: Where’d the idea for “Space Kid and Cat” come from? DAVID KANTROWITZ: Greg Nix (co-creator) and I were throwing around a handful of ideas to pitch Nickelodeon, and this one just stuck! 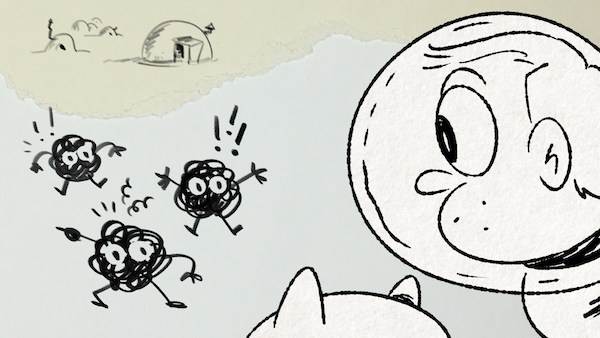 I think Greg pretty immediately locked in on who the characters were, and I got excited about giving it a very hand-drawn aesthetic, so it felt like a clear winner and worth developing further. CAKE: You were working on a shoe string budget to create this series. How did you allot your time when taking on such a major feat? KANTROWITZ: Because it was just the two of us making every episode, it was essential to divide and conquer. We’d write and voice each episode together, then split off. I felt very safe entrusting Greg with the song writing and audio editing, allowing me more time to draw and animate. CAKE: Do you watch the “Rick & Morty” program and, if so, which are your favorite characters and storylines? KANTROWITZ: Love that show! The “interdimensional cable box” episodes are tough to beat. I’d also like to go on the record and say that I love Mr. Poopybutthole, because what an insane sentence to say in an interview. CAKE: Who doesn’t love Poopybutthole? How has the series been received online to date? KANTROWITZ: I’d say pretty well! We’ve gotten a lot of positive feedback, which doesn’t always happen in the world of internet comments, so I’d call that a win. CAKE: The series reminds me of the TBS/Conan O’Brien/Conaco animated series “Final Space.” Who are your animation and writing influences, past and present? KANTROWITZ: You are not the first to make that comparison! I hadn’t heard of it before, but after reading a handful of comments saying the same thing, Greg and I finally looked it up. The more shows that feature cats in space, the better, in my opinion. I’m a lifelong fan of animation (I co-host a podcast about it called “TBToonz”), and I’m particularly fond of older cartoons. I grew up watching a steady stream of classic Looney Tunes and Disney shorts, and I went through a big Tex Avery phase. If I could draw like anyone, it would be the way Harvey Kurtzman did in 1948. In terms of present day, I love The Venture Bros, and you do not want me cornering you at a party to talk about it. CAKE: Corner away! I must say I have a penchant for the 4th episode, mostly because I love school supplies. (No, I won’t reveal my age.) Did you intend to leave the viewer with a takeaway message when you were brainstorming the series? KANTROWITZ: The 4th episode is my favorite too! I’m very happy with it, and I love playing with the idea that these characters could interact with objects beyond the paper they’re drawn on, and hint at a larger world for more meta hijinks. I also only theoretically knew how to pull off some of those stop motion effects, so it was a relief when it all came together. In terms of it having a “message,” that sort of came up organically while making the show. That’s the beauty of collaboration: if left to my own devices, I’d probably lean too far into the visuals and forget about essential things like “story” and “character.” So I tip my hat to Greg for being a talented writer with an innate knack for those things. CAKE: What’s the most daunting aspect to creating a new series? CAKE: Do you own a cat and has said cat secured their space on a SpaceX moon flight? KANTROWITZ: Unfortunately the answer to both is “no,” but I’ll try and remedy that ASAP. CAKE: Time is of the essence! If you ever encountered alien life, what would be the first thing you would ask the space invaders/friends? CAKE: What plans do you have for the online-show from here on out? KANTROWITZ: If we get a chance to make more, I could see us continuing to explore the world of school supplies, and I’m not just saying that because I know how much you love them. But oh, the trapper keepers they’ll go spelunking in! CAKE: Squee! What projects do you have lined up you’d like to share with our readers? KANTROWITZ: I’m doing a fun and weird thing on my Instagram story right now (@davidkantrowitz) where I’m posting panels of a continuing comic I’m drawing, and end with a poll allowing viewers to vote on what happens next. Otherwise, Greg and I are cooking up a bunch of other stuff we hope to share soon! Mentions: Watch Space Kid & Cat on Nickelodeon’s YouTube Channel. Follow David on Twitter & Ig. Also follow Greg on Twitter & Ig.